The term “patent troll” wasn’t coined until the late 20th century, used to describe someone who filed a patent in order not to manufacture products, but to collect licensing fees. 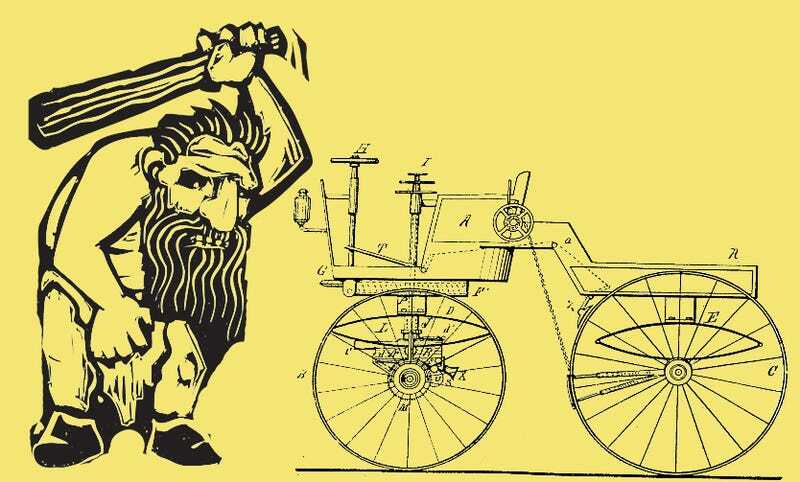 But more than 100 years ago, a patent attorney was a proto-patent troll, exploiting the system to profit off of the burgeoning auto industry. George B. Selden, born in Clarkson, New York, in 1846, had originally wanted to be an engineer, studying the subject at Yale University. But after his father died, Selden ended up switching to law, passing the bar exam in 1871. He worked, quite appropriately, as a patent attorney and never gave up his interest in engineering and invention. When he wasn’t reading patents, he was working on a horseless carriage. In 1879, Selden filed the patent for his “Road Engine,” an improvement on an earlier engine known as a Brayton engine. But he also used his knowledge of the patent system to do something a bit sneaky. You see, Selden knew that, at the time, and American patent lasted 17 years not from the date it was filed, but from the date it was granted. He also knew that an inventor had up to two years to respond to queries from the Patent Office. He just waited as long as he could to reply to any queries and did his best to ensure that any reply he gave prompted more queries from the office, keeping his application alive. Selden realized that, in 1879, there weren’t a lot of folks manufacturing horseless carriages, but he figured it was only a matter of time before the auto industry exploded. So he stalled the approval of his Road Engine application until he felt the time was right. In 1895, as Britain’s Victorian era was coming to a close, the United States Patent Office granted his patent on the Road Engine. It quickly became known simply as the “Selden Patent,” and it was the bane of many an auto manufacturer. Selden claimed that his patent covered all gas-powered automobiles, and so he collected licensing fees from numerous American auto manufacturers. Many a car made at the turn of the century bore a brass plaque declaring that it was licensed under the Selden Patent. One manufacturer whose vehicles did not bear the plaque was none other than Henry Ford. After being denied membership in the Association of Licensed Automobile Manufacturers, which, as of 1903, exclusively controlled the rights to the Selden Patent, Ford announced that he was going to manufacturer his automobiles in defiance of the patent, claiming that no working vehicle had ever been made, nor could ever be made from the patent. (Selden tried to build a working motor buggy based on his patent in 1904; during a 1907 test before court officials, the buggy died after moving a mere five yards.) Ford lost an initial lawsuit dealing with the Selden Patent, but won his appeal in 1911. The court held that Selden’s patent applied only to “a two-cycle Brayton engine,” whereas modern car manufacturers, Ford included, utilized four-cycle Otto engines. The reign of the Selden Patent was over. The fact is that the art ignored what he had to teach, preferring to learn from the European inventors, for it was not until the German and French automobile manufacturers by arduous research, finally proved the merits of the gasoline automobile, that the American manufacturers began to seriously consider the gasoline car as a competitor of the favored steam and electric vehicles. Story found via Inventing the 19th Century by Stephen Dulken. Buggy image from the Selden Patent. Troll image from Jef Thompson/Shutterstock.